In the area of product management, you will encounter quite a few Kano enthusiasts and rightly so: the method is based on a relatively simple question format. Because of this, the Kano method can be used to evaluate almost any kind of product. When employed correctly, the method also enables researchers to uncover customer needs and wishes they wouldn’t have been able to identify using traditional survey methods. On top of that, it’s possible to repeatedly test different product features in a relatively short amount of time-provided you understood the general way the method works. Running a requirements analysis using the Kano method for the first time can admittedly be a daunting task. To remedy this post gives you a comprehensive summary of the needed questionnaire and explains how the evaluation works. Hopefully, this will help you get started with the Kano method. The Kano method results in a clear prioritization of possible product features. This happens based on your user’s opinion. To achieve this, potential users are asked to rate a number of planned features using the Kano questionnaire. In order to develop or define appropriate features, you should ask users, which features they consider necessary and which features they would enjoy on top of that (about 30 opinions on this question are plenty). Of course, you have to keep in mind that this very direct assessment is unlikely to result in innovative new ideas, as users will have a hard time coming up with truly original ideas. 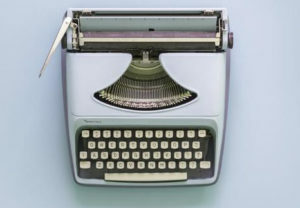 As the people being surveyed also tend to forget mentioning must-be features-they assume that you already thought of those and will, of course, provide them-you should also include ideas generated in your development team. It’s also a good idea to let stakeholder put in their two cents. One a pool of possible future features has been defined the question raises, which of those features actually provides users with additional value and has the potential to delight them. This is where the Kano method comes into play. The biggest step towards gaining insight is already taken once the Kano survey has been run correctly. It’s especially important that you make sure to ask the functional as well as the dysfunctional question! In order to gain the maximum benefit from your raw data, you can employ multiple approaches to evaluation. In the following paragraphs, we’ll explain the standard way to categorize features based on the individual answers, the discrete analysis as well as the continuous analysis using a graph. The features that are being asses are categorized into the categories of the evaluation matrix according to the answers given to the functional and dysfunctional question. The rows of the kano matrix below correspond to the answers to the functional question, the columns correspond to the answers to the dysfunctional question. The relationship between feature functionality and users’ satisfaction can be visualized nicely. 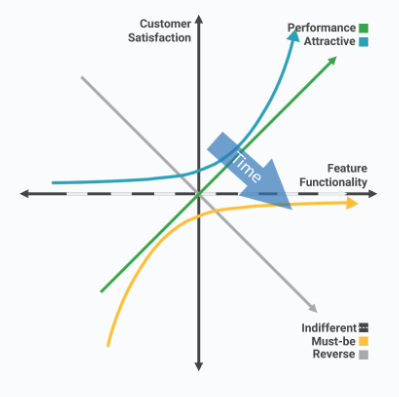 Feature functionality is represented by the x-axis, customer satisfaction by the y-axis. 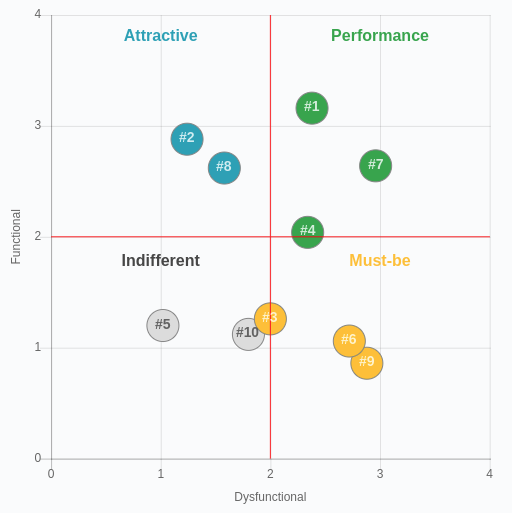 Another factor taken into consideration by the Kano model is the so-called decay of delight. Kano assumes that features don’t stay within one category for an unlimited amount of time. Instead, their ability to satisfy or even delight users are subjected to a certain decay. More precisely this implies that features that were identified as a delighter in a first Kano-survey will after some time become a performance feature and ultimately a must-be feature. As an example of this effect imagine a coffee shop serves every drink with a complimentary cookie. The first time you buy coffee there you will be pleasantly surprised by the presence of the cookie, some weeks later you’re specifically looking forward to the cookie when visiting said coffee shop. After a couple of months you’ll most likely be disappointed if your (free!) cookie is missing. 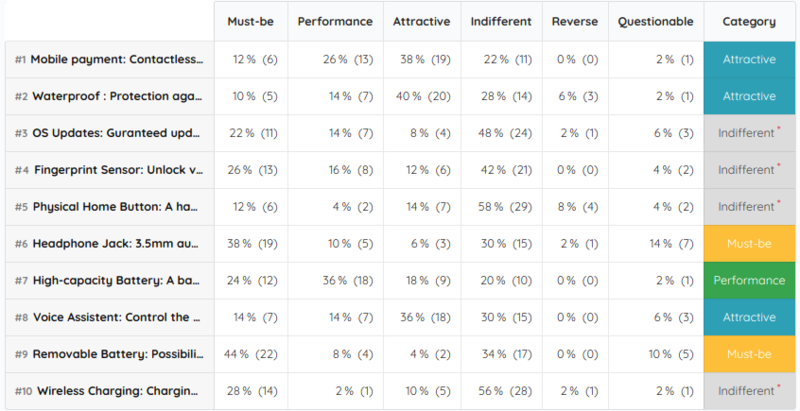 Having assessed which feature belongs in which category individually for every person surveyed, you need to assign one category to every feature based on the opinions of everybody surveyed. The evaluation table is used to keep count of how often a feature has been assigned a certain category. In sum, a feature is always assigned the category that most of the people surveyed considered it to belong to. In case of a draw between two or more categories, the following rule is applied: must-be > performance > delighter > indifferent. Assuming a feature has been assigned the category must-be and delighter by the same number of users, it will finally be assigned the category must-be feature. While the discrete evaluation of a Kano analysis provides you with unambiguous answers and insights very quickly, a small part of the information you gathered will get lost during this method of analysis. The reason for this is the fact that the data you gathered actually lies on a spectrum but is discretized twice during evaluation. The first discretization happens when features are assigned per surveyed person, the second time when features are assigned one category based on the answers of all participants of the survey. Usually, participants don’t assign a feature to a certain category unanimously, because of that there are different tendencies within the categories. In order to represent these tendencies, features can be visualized in a graph. To achieve this, given answers are assigned numbers between -2 and 4 (for the functional question: I like it (4), I expect it (2), I am neutral (0), I can tolerate it (-1), I dislike it (-2); for the dysfunctional question: I like it (-2), I expect it (-1), I am neutral (0), I can tolerate it (2), I dislike it (4)). Using this method of evaluation you can assign an exact value to every feature for every person you surveyed. As a next step, it is possible to calculate a mean value across all participants which can, in turn, be entered into the continuous Kano graph. The most important answers are the ones that end up in the positive (upper right) quadrant of the graph. The resulting graph shows you tendencies which are lost using the discrete evaluation. Irrespective of whether you analyzed your data using the discrete or continuous method, it should show you which features are considered important by your customers and how the implementation of said features influences your customers’ satisfaction. This allows you to clearly prioritize your feature list or product backlog during product development. A general rule you can apply in order to prioritize features based on their category is must-be > performance > delighter > indifferent. Implementing not only must-bes and performance features but also making room for delighters during product development can obviously give your products a clear competitive advantage compared to competitors. Obviously, you should immediately exclude features that are assigned the category reverse from your roadmap. Another possible way to use the categorization of features is to compare your product to the competition’s products: did they implement features you identified as performance features especially well? If so, you should try and catch up to them as quickly as possible. To sum it up, keep in mind that you should implement all must-be features and that your performance features should be able to compete with the competition’s. Finally, you have the opportunity to stand out from the crowd by implementing performance features. Running a Kano analysis using paper questionnaires or interviews is to time-intensive, implementing an online survey using common survey tools too cumbersome? Use our Kano+ tool to simply describe your features and get going immediately. Participants are surveyed automatically and the evaluation is automated as well.